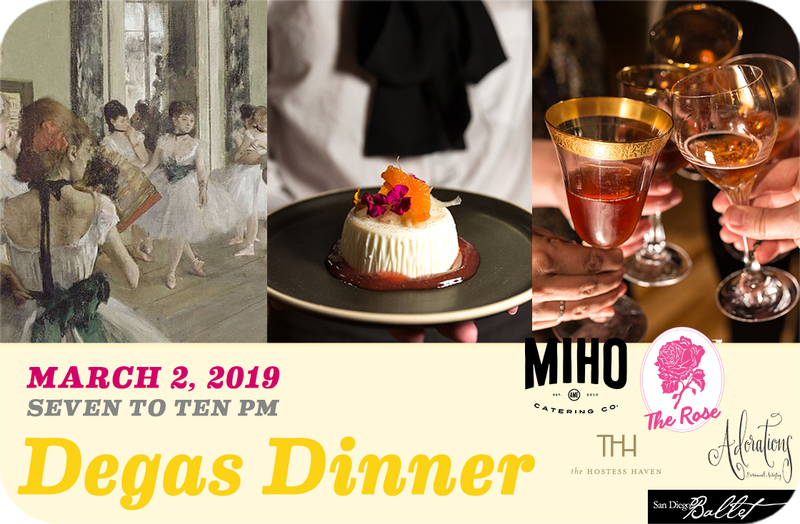 To celebrate Sparks Gallery’s upcoming 4 Year Anniversary, our next dinner party will observe the body in motion through art, music, and performances throughout the evening, and will be inspired by the famous French painter Edgar Degas (1834-1917). During this exclusive event interspersed with contemporary ballet performances by the San Diego Ballet Company dancers, we will be lead through a gastronomic journey catered by MIHO, taste exotic wine poured by The Rose Wine Bar, and mingle in European-style tables designed by Hostess Haven with florals by Adorations Botanical Artistry. Limited to 60 seats; 21+ Only.